What computers did you find running on the local network? What IP addresses did you find running on the local network? What is the operating system of your target machine? Find out what ports are open on the machine that you just scanned? Find out if the system is infected with malware or virus. Search for unauthorized servers or network service on your network. Find and remove computers which don’t meet the organization’s minimum level of security. If a server deny the ping reply for security reason, you can add -sS to bypass this feature and is good for stealth skinning. add -Pn ensure that no ping request is sent with the scam. lastly add a -O which tells the nmap to attempt to determine the operating system. specify how many port you want to scan: -top-ports and -port-ratio.Top-port <n> scans the most commonly open <n> ports for each protocol requestedport-ratio <n> (where n is between 0 and 1) scans all ports with a frequency of at least the given level. UDP scan usually take longer time but it do worth your effort. 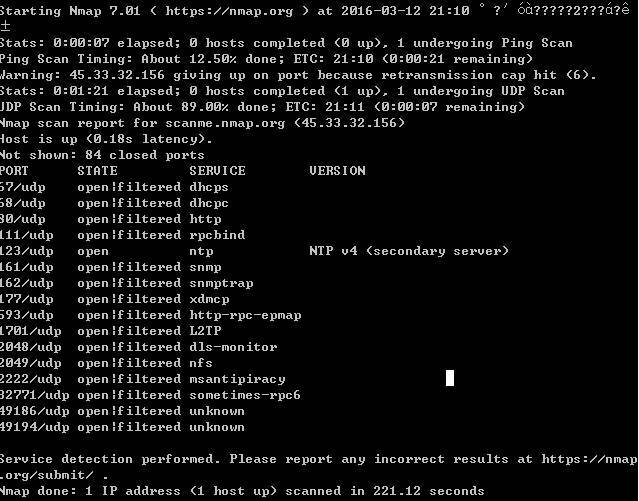 Fast scan: nmap -sUV -F -T4 scanme.nmap.org , when you hit the Enter, it show you the progress of the scanning. Solution: Use both -echo request and one of the other two. -v: verbose, display the process. -A: append the output to a file instead of overwrite it. -oX: write the output in xml format. the reason I use the /var/www/html to store the html is you can browse it by input the 127.0.0.1/file_name.html to browse it from a browser. use service apache2 start if your web service is not running. Alternatively, you can browse it by double click it in the other folder as well.